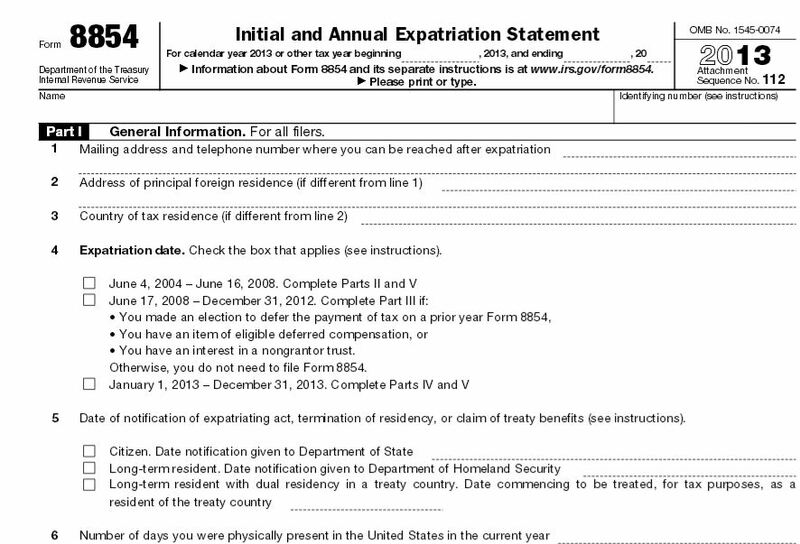 How many former U.S. citizens and long-term lawful permanent residents have filed (or will file) IRS Form 8854? Can this information be obtained directly from the IRS through a Freedom of Information Act (“FOIA”) request? See, Does IRS Notice 2009-85 regarding expatriation have the “force of law”? Posted April 14, 2014.
terminated U.S. income tax residency by application of a U.S. income tax treaty (in the case of LPRs). The one certainty under the law, is that any former USC or LPR, regardless of their wealth or income, will necessarily be a “covered expatriate” if they do not file IRS Form 8854 and meet the certification requirements under the law. This begs the question: how many have filed IRS Form 8854? Why Section 7701(a)(50) is so important for those who “relinquished” citizenship years ago (without a CLN). . .